To book your vacation rental, the two most important things you need to do are: collect a payment, and get your contract signed. Naturally, you want to make this as convenient and as simple a process for your guests as possible so that you can get that signed contract back, confirm the reservation, and mark those nights off your calendars as soon as possible. If you use a paper form, then you face delays that may lose you the booking. Often you'll find yourself waiting for your prospective guest to find a scanner or a fax (with additional delays if the document comes through illegibly or missing pages), or facing several days of limbo for the contract to arrive in the mail (again, with added delays if it arrives incomplete). Fortunately, there are several affordable and easy ways to set up your written agreement online so that your guests can sign electronically. 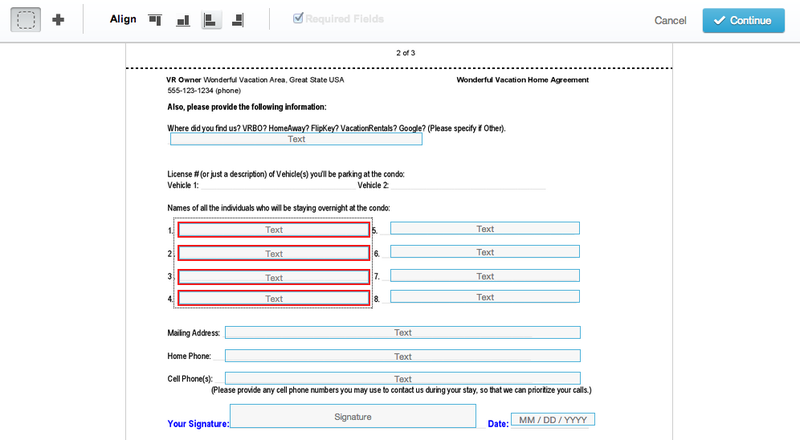 Electronic Signatures (a.k.a. Digital Signatures), when collected in accordance with your country's laws, are legally binding, as well as more efficient. Since the year 2000, passage of the United States Electronic Signature in Global and National Commerce Act (ESIGN) has enabled all U.S. businesses to safely make use of digitally signed contracts. And there is equivalent legislation that also makes digital signatures binding in Europe and other regions. But the simplest way to ensure you're covered and get started quickly is to pick an established online electronic signing service. 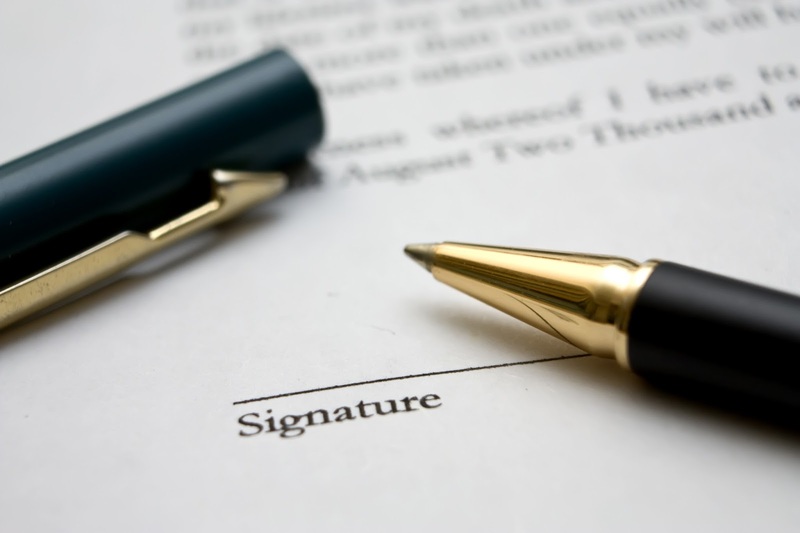 As mentioned before, there are several other digital signature service providers, like EchoSign and RightSignature. 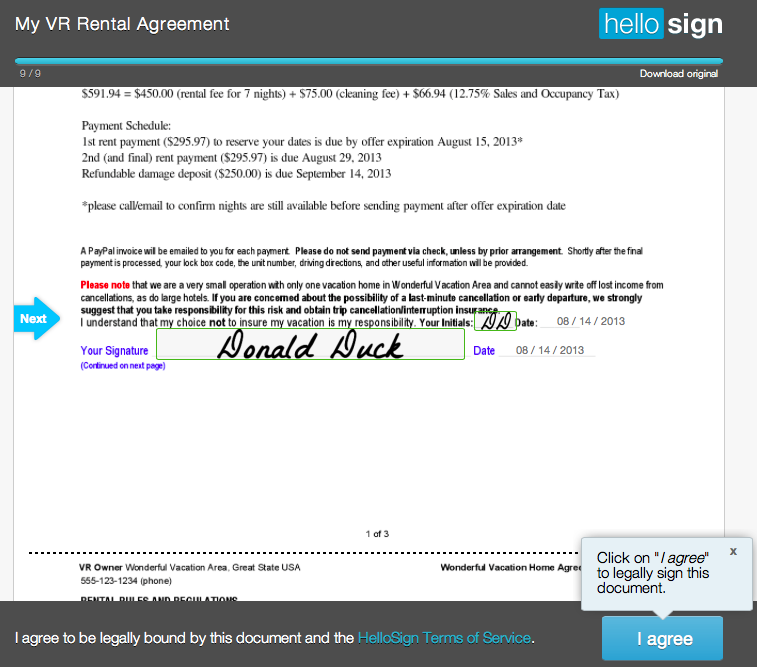 But in this article I'm going to show you how to set up your vacation rental agreement using HelloSign. We've been using HelloSign since it launched late in 2012; and so far, we've been delighted with it. HelloSign charges nothing for their most basic account level (Fees do apply for various upgrades and usage volume, which I'll address further on in this article). Since it's free to get started, why not give it a try? Your first step is to visit HelloSign.com (referral link) and register for your free account. You can sign in using your Google account (if you have one); but if you want your contracts to be presented to your guests as coming from your Vacation Rental, then you'll want to register for your HelloSign account using the email address associated with your business. 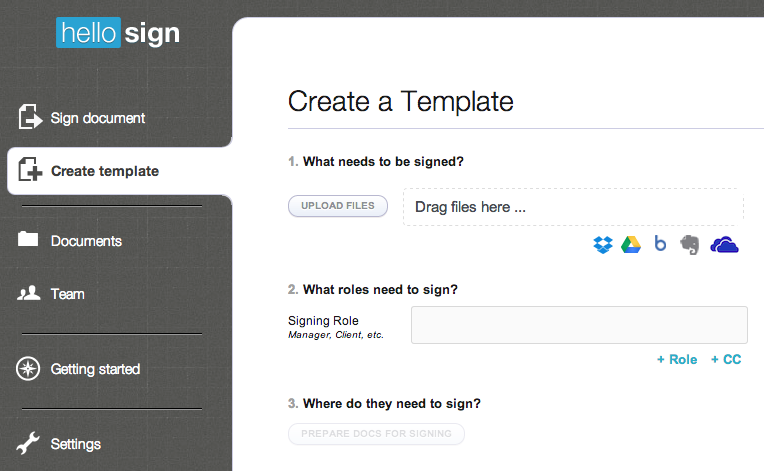 Once you've registered and are signed in, your second task is to create a "Template." 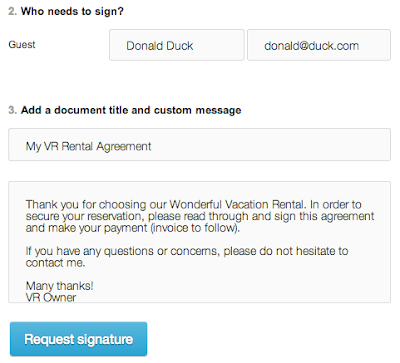 For a VR Rental, this should be your Rental Agreement or Contract set up like a reusable form, with blanks provided for the names, dates, and amounts that are unique to each booking, as well as places for the signatures, contact information, etc., that you will need your guests to fill in. Once I've guided you through all these steps, I'll show you how to send an agreement to a guest for signature. So let's get started! 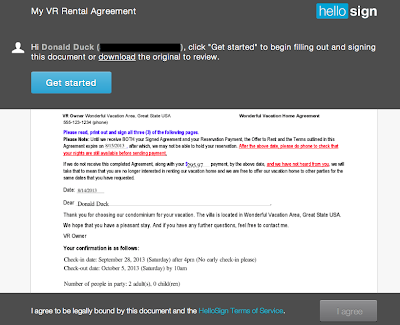 Next, upload a generic version of your Rental Agreement. HelloSign supports several different file formats, including PDF and Microsoft Word. You can upload your document from your computer, or if you have the file stored in a cloud service like DropBox or Google Drive, then you can copy it over from there using the appropriate icon. Since this particular textbox is intended for an expiration date (the deadline by which the guest must sign the contract), this should be a field that you, as VR owner, will fill out before you send an Agreement to a guest for signature. So in answer to the prompt "Who fills this out?" you should pick "Me (when sending)". 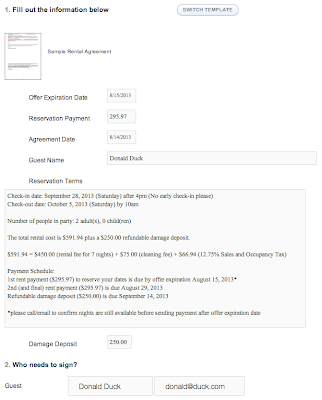 You also need to give this field a name, which will serve as a label to prompt you on what to type when you use the template to create a contract for a specific booking. In the example above, we labeled this textbox "Offer Expiration Date." For spaces in the Agreement where you would like your guest to initial, or sign and date, drag one of the corresponding "Signature," "Initials," or "Sign Date" boxes from the top down onto your Agreement. And, for each one, select "Guest" in the "Who Signs Here" field (or whatever label you chose for that role). 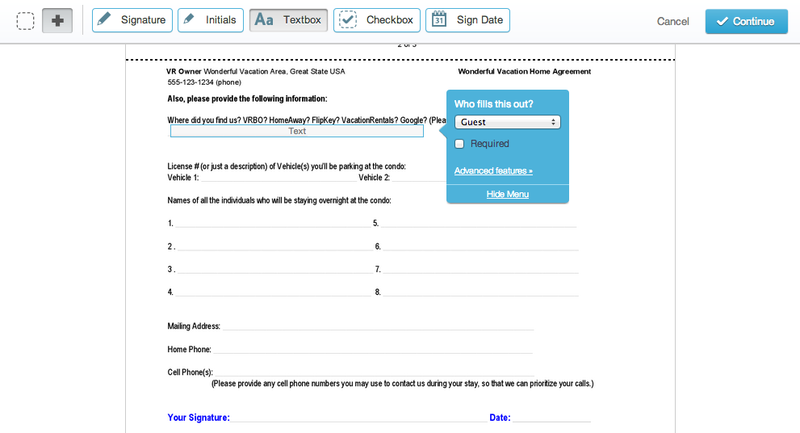 For information you may want the guest to provide as part of the contract, such as, the names of each member of his group, phone numbers or other contact information, etc., you can drag on a "Textbox" and also resize it. Again, you will want to specify a role for "Who fills this out?". 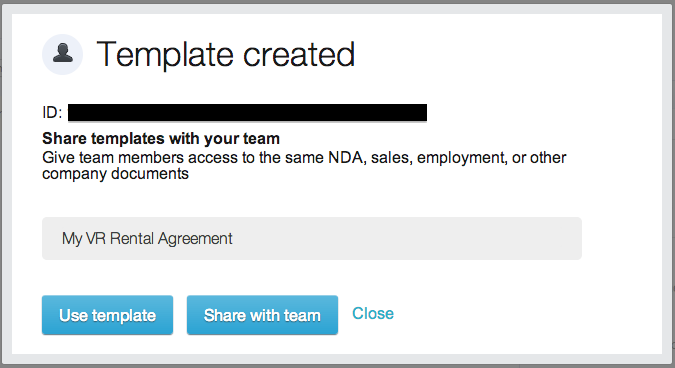 Notice that you do not need to label this textbox, since the individual who fills in the value will see it as part of the text in the Agreement. Also, you can make sure no important signatures or information are overlooked by the person signing your Agreement, by checking "required" for each piece of information or signature that you do not wish to be optional. Dragging field boxes onto your Agreement document free-hand and arranging them neatly can be tedious. However, HelloSign provides a tool to line up your boxes either horizontally or vertically. In the above example, notice the two columns of fields where we ask for the name of each member of the group staying at our condo. To ensure the names typed in by the Guest line up neatly, you can select the dotted box in the upper left corner of the screen, and then click and drag on the screen to highlight all the fields you want to align. Once selected, you just click one of the align button at the top of the screen. Once you've added all the fields where either you or your guest must type in information pertaining to a specific booking, plus all the blanks where you need it signed and dated, click "Continue." You're almost finished with your reusable Agreement Template. 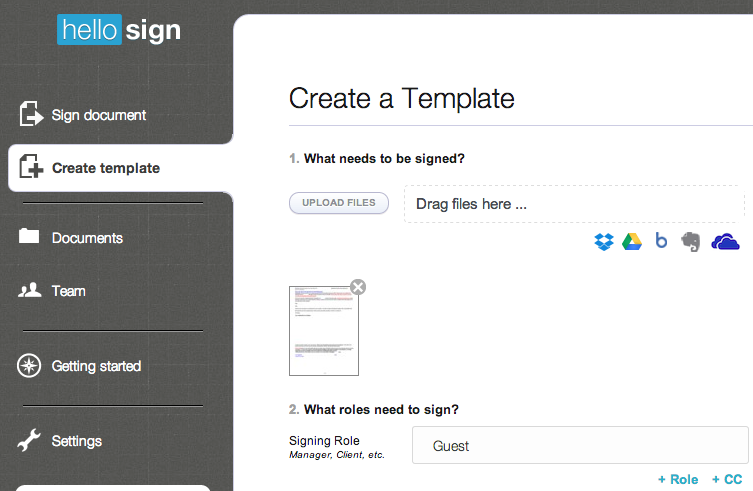 Now you should be back at the Create Template screen, with only two more fields to complete. 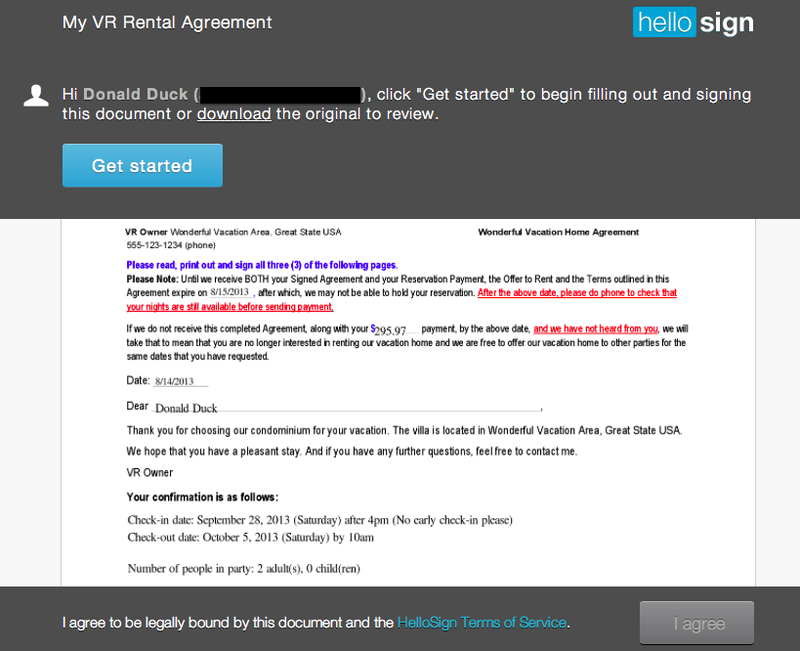 The first of these is the name of your document, in this case the Agreement, which we have called "My VR Agreement". You may want this to reflect the name of your Vacation Rental property, since it will appear in the subject line of the email that your guest will receive. Lastly, compose a default message that you wish to accompany the link to the now signable Agreement that will be emailed to your potential guest. 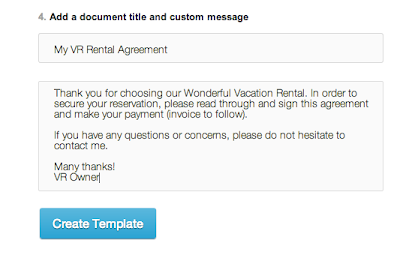 As you use your Agreement Template to create the contract you are sending out to be signed, you will be able customize this message for each booking, if you need to. 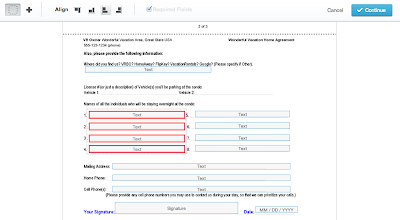 Now your reusable Agreement Template can be used to customize and send a Rental Agreement to whomever you wish for signature. 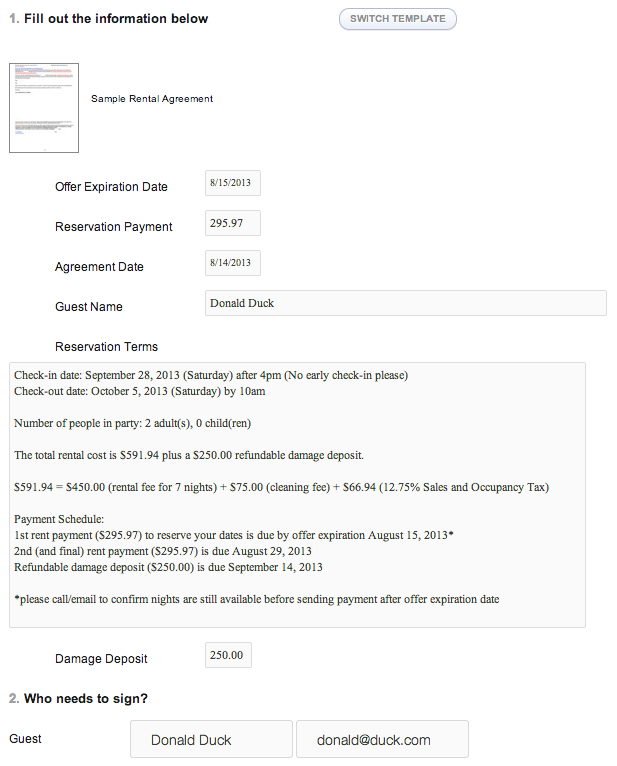 If you're ready to make a booking immediately, click "Use template" now. 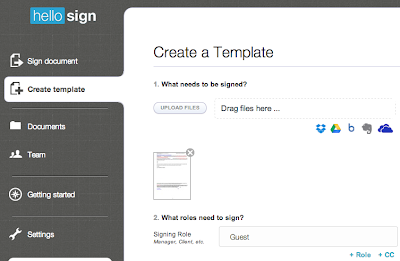 If you aren't ready to gather signatures right now, you can "Close" and retrieve your Template later by selecting the "Documents" tab on the left. From there you can filter by Templates, to more easily find the one you want, and then activate the pull down menu to the right of each document listed to "Use Template." Provide an Email Address, and (if needed) Customize the message to your guest, then click "Request Signature"
Customize the message to your guest and click "Request Signature"
Near the bottom of the screen will appear the document title and the default message, which you set up previously while creating this Template. You can customize these fields, before they are included in the email that is sent to the guest requesting their signature. Once you are done filling in all the fields and customizing the message, click "Request Signature." 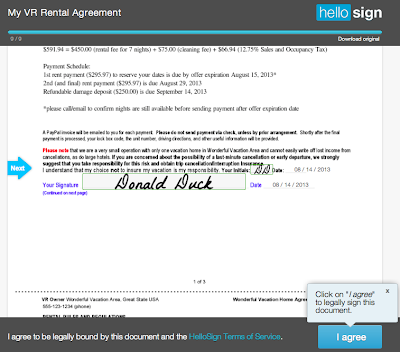 HelloSign sends an email to your guest asking them to review the document (which is a copy of your Agreement Template, with all the the names, dates, and amounts that pertain to this booking that you typed in earlier). Once the guest clicks the link in that email, you will be notified by HelloSign that the guest has "viewed" the document (but not yet signed). 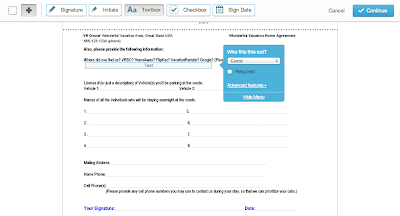 Once your guest has completed and signed the form, they must click the "I agree" button (which will not become active until all required fields are completed). At this point, both you and the guest will receive an email to let you know that the contract has been signed, and a downloadable copy will be provided to the signer. You should now see the signed Agreement listed in your Documents page in your HelloSign account, and you can download it from there. By typing in his name and clicking on "I Agree," your guest has provided you his legally binding signature, and you can rely on a downloaded copy of the signed Agreement in the same way that you would on a scanned/emailed or faxed copy of a contract with a physical signature. 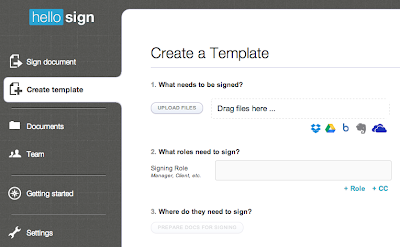 Currently HelloSign offers a free account, which allows the user to create one template, and make 3 signature requests per month. If you only have 1 property, and typically don't take more than 3 bookings in a month, then this may be perfect for you. If you have multiple properties, with different contracts, or take more than 3 bookings a month, then you may wish to upgrade to a Business account for $15/mo. The Business account offers unlimited templates and signature requests, as well as several other advanced features, such as the opportunity to brand the pages that your guests will see when they complete and sign your agreement with your company logo. Another great business account feature is "in-person signing", which is useful for last minute bookings when the guest signs the Agreement upon arrival on the check-in day, by allowing the owner to collect a signature directly on his iOS (iPhone/iPad) or Android tablet. If you use this link to HelloSign to register, and later decide to upgrade to a Business account, then - in addition to a 30-day free trial - you will also receive a free $10 Amazon gift certificate. And so will I. So thanks in advance for your support. If you try out HelloSign, or another digital signature service provider, then please share your experiences in the comments section below. And if you'd like to get more tips and tutorials like this, I invite you to subscribe to our RSS feed so you will be notified of new posts. Can you make a Profit from Renting your Vacation Home?